At this point we need Carmelo Anthony to get traded just so we can have time to discuss whether Brett Favre is really retiring. The biggest story in the NBA right now still consists only of stories, not an actual transaction. The Anthony updates piled on with increasing urgency Sunday, walking us up to the verge of a deal that would send Anthony and Nuggets teammate Chauncey Billups plus Detroit's Richard Hamilton to the Nets; Derrick Favors, Devin Harris, two draft choices and Anthony Morrow, Quinton Ross, Ben Uzoh and Stephen Graham to the Nuggets; and Troy Murphy and Johan Petro to the Pistons. The principals -- Denver, New Jersey, Carmelo and Favors -- are the same as in a multiteam deal that fell apart in September. Ever since then it's been an oscillating wave of rumors about Anthony, finally ramping up last week after Anthony's agent, Leon Rose, brought client Hamilton and the Pistons into the mix, coinciding with two dismal losses by the Nuggets (with their full complement of players finally available) against the Clippers and Kings. Three executives I talked to Sunday night said the Nuggets have been holding up the process, perhaps because they're understandably reluctant to part ways with the franchise player. One team executive said, "You've got to understand you're dealing with a first-time GM [Masai Ujiri] and a first-time president [Josh Kroenke]. They've got to come to grips with the fact they're trading Carmelo Anthony." It would be the most dramatic move of the season following a summer of unprecedented attention paid to roster moves. And it sounds exciting until you realize ... it wouldn't really change anything right now. The Nets, currently 10-27 and five games out of the final Eastern Conference playoff spot, might sneak into the postseason. If Anthony signs the three-year, $65 million contract extension that's waiting for him the Nets would have a star player to make plunking down money for seats and suites in the new Brooklyn building sound a lot more appealing, and he could even lure some people to Newark in the interim. But they don't become an instant threat to the Celtics, Heat, Magic or Bulls in the Eastern Conference. And by taking on Hamilton's contract they wouldn't be in position to add a significant free agent in 2012. Their message would be the same it has been for the past few years: Wait. At least the Nets would have their foundation in place. The Nuggets would just be starting the digging process. As one executive who has had to dismantle his team's core before texted me: "Nowhere but down now for them. It's a long way down too." The Pistons would satisfy their objective by moving Hamilton and the two years and $26 million left on his contract beyond this season. They'd have an abundance of salary-cap room this season ... but once again it would come at the wrong time. The last time the Pistons could afford to shop the free-agent marketplace was 2009, when they spent on Ben Gordon and Charlie Villanueva, forcing them to sit out the frenzy of 2010. The biggest unrestricted free agent this summer figures to be Memphis' Zach Randolph, who can get you 20 points and 10 rebounds, but has yet to get a team past the first round of the playoffs. By taking on Hamilton's contract the Nets wouldn't be in position to sign big free agents in 2012, when Dwight Howard, Deron Williams and Carmelo's buddy Chris Paul could opt out of their contracts. Of course that would entail the players walking away from a collective $55 million, money that might not be there under the next collective bargaining agreement. If they want all want to ride their current contracts, they could be free agents in 2013, when Hamilton's contract would come off the Nets' books and New Jersey could be poised to make a run at one or two of them. Then we could say for sure it was a big trade. What do you say we convene in a couple of years and resume this discussion? No? OK, let's go down to Mississippi and camp out on Brett Favre's lawn. No team ever believes it receives equal compensation for trading away a franchise player. Even so the proposed three-team swap between the Nuggets, Nets and Pistons appears to be a good deal for Denver. This transaction would save over $5 million in salary, assuming all players have received half their pay to date, and $10 million in luxury tax payments. Denver could possibly swing another salary-slashing deal and squeeze under the tax limit. The benefits are not only financial. Derrick Favors is the best young player who was made available throughout the process. He is the jewel of the trade and potentially a franchise cornerstone for years to come. The other quality piece involved is Devin Harris. I was confused why Denver was so adamant about not receiving Harris from the start. He is a good player with a reasonable contract and the Nuggets can flip him before the trade deadline if they so choose. However, I believe Harris and Ty Lawson can play together for stretches, allowing both to play 30 minutes a night. The only other long-term contract Denver is taking on is Anthony Morrow. He would look great receiving kick-out passes from Lawson and/or Harris. The two draft picks are exciting, but obviously provide an unknown quantity. I assume one of the two picks involved is Golden State's 2012 first-rounder and Denver would be wise to seek the Rockets' 2012 first-rounder the Nets recently acquired. Denver would also benefit from financial flexibility for the first time since 2004 and everyone loves cap space even if some teams have no idea how to use it. Finally, should this trade be consummated, the greatest benefit might be putting this increasingly miserable season to bed. Denver played well early despite the constant rumors. However, lately the team has been struggling, experiencing embarrassing losses to the Kings and Clippers by a total of 33 points. Then came the 97-86 home loss to the Hornets. The entire campaign has felt like a charade with the front office, players and fans held hostage to the conjecture and speculation. It is time for the next chapter of the Nuggets franchise to begin. Pistons president Joe Dumars tried rebuilding while remaining competitive, and he has failed on both counts. Undesirable contracts fill the Pistons' roster, and Detroit sits 12 games under .500. Few fans believe in Dumars' plan, and only slightly more believe in him. But if he can pull off his reported end of the Carmelo Anthony trade -- Richard Hamilton for Troy Murphy, with Johan Petro and a draft pick possibly included -- the mood surrounding the franchise will dramatically change. Detroiters won't have to wait a few weeks for Punxsutawney Phil's verdict. They'll know winter is ending early. It has gotten so bleak, fans are clamoring for a trade that would send away the Pistons' leading scorer the past eight seasons for a forward unlikely to remain on the team next season and a center whom Detroit will take only if he's packaged with a draft pick. The biggest benefit of the deal comes in the flexibility of Murphy's expiring contract. Although plenty of variables need to shake out -- the new collective bargaining agreement and the impending free agencies of Tayshaun Prince, Rodney Stuckey, Tracy McGrady and Jonas Jerebko -- the Pistons could make a run at Nene Hilario, Zach Randolph, Marc Gasol, Samuel Dalembert or DeAndre Jordan this summer. But more immediately, the trade could help the Pistons contend for the playoffs. Murphy's rebounding and an increased role for Ben Gordon might prove the necessary recipe for Detroit to sneak into the postseason in a dismal Eastern Conference. Sadly, this would mean the unceremonious end of Hamilton's Pistons career. Although he helped Detroit win a title and remains the team's all-time leading playoff scorer, many fans have soured on him after The Detroit News reported a team source said Hamilton "quit" on the team. Most fans will probably wish Hamilton well -- as long as he's no longer in Detroit. Everyone is ready for a fresh start. LeBron James, Heat: Mr. Embracing-His-Inner-Wrestling-Villain leaped from the top rope and dropped the figurative elbow on the Trail Blazers with 44 points, 13 rebounds and 6 assists in a 107-100 overtime road win. Warriors' starting backcourt: Monta Ellis and Stephen Curry can shoot with the best of them. But in losing to the Clips, the two combined to shoot 6-for-32 (18.8 percent) in a 105-91 loss. Ellis, the NBA's third-leading scorer, had 13 points. "You look at games like this and moments like this and you really understand why we decided to team up and come together." -- Heat guard Dwyane Wade, after LeBron & Co. earned their 12th straight road win. Whether graded in terms of the competition or their own level of play, this was easily the Lakers' best win of the season. There was a buzz in Staples Center from the opening tip, and the defending champs proved themselves worthy of that din. Heading into most games, the Lakers boast a notable size advantage, and this game against the Knicks was truly no exception. Amare Stoudemire and Ronny Turiaf are New York's only bigs of note, and while the former is playing like an MVP and the latter plays his guts out, that doesn't make either guy bigger or taller. Pau Gasol noted afterward the expectation of this duo being paired often to at least attempt to offer some bulk, but that wasn't the case. Still, the Lakers often forget their gargantuan stature compared with the rest of the league, inexplicably playing outside-in rather than inside-out. Well, not tonight. Andrew Bynum, Gasol and Lamar Odom combined for 51 points, absolutely overwhelming the opposition with length and bulk and contributing heavily to the team's 50 points in the paint. Being paired against Stoudemire qualified as a true "test" matchup for Drew, still rounding his way into form after a long absence. He's looked progressively better, but has also never played against someone of Amare's caliber. Well, the advantage was certainly the kid's this evening. Many of his 18 points (including a serious posterization) were at Amare's expense, while Stoudemire required 24 shots to notch 23 points in part because Drew was a demon challenging them. In particular, Stoudemire's first half was miserable. Nine misses on 10 tries, with just five points for his troubles. Had Drew's night not been cut short by a sketchy ejection (more on that later), the night might have turned even more pointedly lopsided. Gasol nearly had a double-double before the first half ended and his jumper from the free throw line felt automatic. His defensive presence was increasingly felt throughout the game, rounded out with a quartet of blocks and two steals. As for Lamar Odom, 13 points, plus a game-high 18 boards to complement four assists. Just another quality effort toward what feels like an inaugural All-Star campaign in the making. 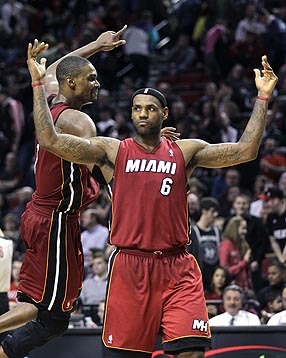 LeBron James and Chris Bosh celebrate their victory over the Portland Trail Blazers. LeBron seems to be embracing the road boos.